A parliamentary report of 1777 recorded parish workhouses in operation at Crawley (for up to 8 inmates), Withyham (43), and Worth (20). Although not mentioned in the 1777 survey, East Grinstead had a parish workhouse from 1747 located on London Road. In 1851, this was adjacent to the Rock Gardens, at the west end of what is now Institute Walk. What is now Fir Tree Cottage on London Road in Crawley was shown on an 1830s tithe map as Crawley Workhouse. Crawley former parish workhouse, 2005. 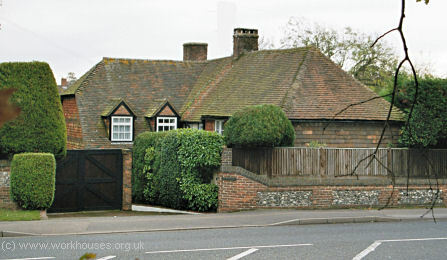 A house dating from 1729 on Newchapel Road at Lingfield formerly served as its parish workhouse. The house is now known as "The Garth". Lingfield former parish workhouse, 2005. Hartfield had a parish workhouse on Church Street. The building survives as the Anchor Inn. County of Sussex: Crawley, East Grinstead, Hartfield, West Hoathly, Withyham, Worth. Later Additions: Forest Row (from 1894). The population falling within the Union at the 1831 census had been 11,476 with parishes ranging in size from Crawley (population 394) to East Grinstead itself (3,364). The average annual poor-rate expenditure for the period 1833-35 had been £12,053 or £1.1s.0d. per head of the population. 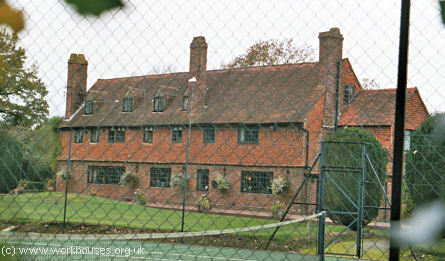 Initially, the new East Grinstead Board of Guardians retained four existing parish workhouses for use by the union at East Grinstead, Hartfield, Crawley, and Lingfield. In 1859, a new workhouse accommodating 260 inmates was erected at the south side of Glen Vue Road in East Grinstead. It was designed by Frederick Peck who was also the architect of workhouses for the Medway and Hertford Unions. It was constructed by the firm of Peck and Stevens at a cost of £5,680. East Grinstead workhouse site, 1875. The workhouse buildings no longer exist and housing now occupies the site. West Sussex Record Office, County Hall, Chichester, West Sussex PO19 1RN. Holdings include Guardians' minutes (1835-1930); Births register (1880-1940); Deaths register (1880-1948); Creed register (1869-1936); Lunatics in the workhouse (1891-1928); Register of children put out as servants (1929-39); etc.